Signed and inscribed to CAROL (Lotz) Lantz, daughter of Charles Lotz (1891-1965), a prominent band director from Canton, Ohio. Apparently Boswell performed sometime with Lotz’s band and signed this photo for his daughter. From the Lotz family collection. SOURCE: From the archives of the World War History & Art Museum (WWHAM) in Alliance, Ohio. WWHAM designs and delivers WWI and WWII exhibits to other rmuseums. Our traveling exhibts include Brushes With War, a world class collection of 325 original paintings and drawings by soldiers of WWI, and Iron Fist, an HO scale model of the German 2nd Panzer Division in 1944 with 4,000 vehicles and 15,000 men. I am fond of being alive, and dead people don’t blog, but I wish I’d been around to ask Fats, Connie, Bunny, Lips, Bird, and Chick for their autographs. Posted in "Thanks A Million", Bliss!, Generosities, Hotter Than That, Irreplaceable, It's A Mystery, It's All True, Jazz Titans, Jazz Worth Reading, Pay Attention!, Swing You Cats!, The Heroes Among Us, The Real Thing, The Things We Love, Wow! What follows is the Official JAZZ LIVES Love Song. It captures my feelings exactly and deeply, and the music that accompanies it is perfectly delightful. My guess about the composition of this song is that Akst created the melody, Brown the lyrics, and that they called on Ms. Maxwell for the details of Society that would make it authentic. (I can invent the dialogue for their meeting, and I am sure you can also.) I’ve not seen the film nor a copy of the sheet music, but the song was recorded in Chicago by Charles LaVere and his Chicagoans, and we have the performance I love through a series of nearly miraculous kindnesses. Before I write more, you should hear the music. The video below was created by the exceedingly talented Chris Tyle (cornet, clarinet, drums, vocal, jazz scholar, bandleader, archivist, writer . . . . ) as a special commission for JAZZ LIVES. Alec Wilder would have called the song “notey,” and deplored the repeated notes; I am amused by the way the lines spin out to accommodate the lengthy lyrics . . . but it goes right to my heart. The musicians are Charles LaVere, vocal (and possibly trumpet); Johnny Mendell and Marty Marsala, trumpets; Joe Marsala, clarinet / alto; Joe Masek, tenor; Boyce Brown, alto; Preston Jackson, trombone; Jess Stacy, piano; Joe Young, guitar; Israel Crosby, bass; Zutty Singleton, drums. That’s some band. I find the lyrics particularly charming. Of course the notion that “I like you a lot” is a familiar refrain in love songs. “I like pie, I like cake, I like you best of all,” another. “It all depends on you” and “I wanna go where you go — then I’ll be happy,” other variations. But this song, where the singer says “I prefer your company to that of famous members of the upper class who would offer me unique experiences so far beyond the ordinary,” is offering a special kind of love-bouquet. And it is witty and sweet that the singer doesn’t say, “Mrs. Astor wanted to sleep with me but I told her NO because I like you better.” No, the lyrics advance a series of whimsical rhetorical possibilities — which must have been especially striking in the Depression: IF Mrs. Vanderbilt invited me to dine . . . and I think we are expected to know that this is a dream rather than a real invitation, and that the singer and the Beloved do operate in the world of the shared hot dog at Coney Island. But love often is charmingly hyperbolic, and the singer insists, “My preference for you, my fidelity to you, is not a simple matter of preferring you more than your real peers. I’d rather be with you than with anyone else, no matter how rare and glittering the experience anyone else could offer.” That, to me, makes it a deep and authentic — even while whimsical — offer of love. This — eighty seconds — is a fully satisfying musical offering. But there’s more. After an interlude concluded by Zutty and a two-note phrase from Preston Jackson, Charles LaVere begins to sing. (Is it Marsala or Mandell echoing and improvising around and under him?) His diction is refined; he is offering us the story in the clearest way. But the vibrato-laden way in which he ends phrases is both intense and heartfelt; his reading of “be” in the song’s title is so touching. We know he cares! On a second or third listening, we can honor Jess Stacy, stealing the show yet again. Tenorist Joe Masek brings out his best early-Thirties Hawkins, and one of the musicians (or a studio onlooker) lets out a fervent yell of approval at 2:37. I agree with the anonymous emoter. And the final eight bars are a full-band ensemble, both tender and rocking, driven on by embellishments from Preston Jackson and Zutty’s cymbal. It’s the combination — witty lyrics without a hint of satire, delivered with the utmost feeling over a hot jazz background — that does it for me. I send this to performance and video to my Beloved, who has already heard and felt the song. I encourage you to send it to your Beloved. If you don’t have a Beloved at the moment and would like one, play this over and over until the music and the lyrics are brilliantly resonant in your head, then hum and sing it under your breath as you go through your day. It will, I am sure, attract the love of your life to you. We have all seen our share of documentaries, perhaps beginning in elementary school. The least successful are tedious although well-meaning, taking us year-by-year, serving up moral lessons. Although they strive to inform and move us, often they are unsatisfying and undramatic in their desire to present us with facts. Jeff Kaufman’s brilliant feature-length portrait is a soaring antidote to every earnest, plodding, didactic documentary. It is full of feeling, insightful without being over-emphatic. It tells several stories in affecting, subtle ways. Chick Webb was a great musician — a drummer other drummers still talk about with awe and love. He guided and lovingly protected the teenaged Ella Fitzgerald, helping her grow into a mature artist. Crippled from childhood — he would never grow much taller than 4′; he was in constant pain; he died shortly after turning thirty — he was fiercely ambitious and ultimately triumphant in ways he did not live to see. But this is far more than the story of one small yet great-hearted man. It is much larger than the chronicle of one jazz musician. It is the story of how Webb’s love, tenacity, and courage changed the world. That sounds hyperbolic, and I do not think that any American history textbook has yet made space for the little king from Baltimore, who deserves his place alongside Rosa Parks and Jackie Robinson. This film will go a long way towards correcting that omission. For Chick, tiny yet regal behind his drum set, helped create an environment where Black and White could forget those superficial differences and become equal in the blare of the music, the thrill of the dance. Without Webb, would there have been a Savoy Ballroom where American men and women could have forgotten the bigotry so prevalent, lost in the joy of swing? I like to imagine someone, trained into attitudes of racism from birth, hearing HARLEM CONGO on the radio and feeling transformed as if by a bolt of lightning, not caring that the players were not Caucasian, making the shift in his / her thinking from cruel derision to admiration and love. How may people moved to an acceptance of racial equality because they were humming Ella’s recording of A TISKET, A TASKET? We will never know . . . but just as the sun (in the fable) encouraged the stubborn man to shed his heavy coat where the cold wind failed, I believe that jazz and swing did more than has ever been acknowledged to make White and Black see themselves as one. And the film documents just how aware Webb was of the reforming power of his music. The idea of him as a subtle crusader for love, acceptance, and fairness is not something imposed on him by an ideologically-minded filmmaker: it is all there in the newspaper clippings and the words he spoke. Here is Candace Brown’s superb essay on the film — with video clips from the film. I must move from the larger story to a few smaller ones. Put bluntly, I think filmmaker Kaufman is a wonder-worker, his talents quiet but compelling — rather like the person in the tale who makes a delicious soup starting with only a stone. It took six years and a great deal of effort to make this film, and the result is gratifying throughout. Making a documentary in this century about someone who died in 1939 has its own built-in difficulties. For one thing, the subject is no longer around to narrate, to sit still for hours of questions. And many of the subjects friends and family are also gone. Chick Webb was a public figure, to be sure, but he wasn’t someone well-documented by sound film. Although his 1929 band can be heard in the rather lopsided film short AFTER SEBEN, the director of that film cut Chick out of the final product because he thought the little man looked too odd. But back to Kaufman’s problem. Although there are many recordings of Chick’s band in the studios and even a radio broadcast or two, other figures of that period left behind more visual evidence: think of the photogenic / charismatic Ellington, Goodman, Louis. Of Webb and his band in their prime, the film footage extant lasts four seconds. So Kaufman had to be ingenious. And he has been, far beyond even my hopes. The film is a beautifully-crafted tapestry of sight and sound, avoiding the usual overexposed bits of stock film and (dare I say it) the expected talking heads, droning into the camera. The living people Kaufman has found to speak with love of Chick Webb are all singular: jazz musicians Roy Haynes (swaggering in his cowboy hat), Joe Wilder (a courtly knight without armor), Dr. Richard Gale (son of Moe, who ran the Savoy), dancers Frankie Manning and Norma Miller . . . their affection and enthusiasm lifts up every scene. And Kaufman has made a virtue of necessity with an even more brilliant leap. Webb wasn’t quoted often, but his utterances were memorable — rather like rimshots. Ella, Gene Krupa, Ellington, Basie, Helen and Stanley Dance, Artie Shaw, Mezz Mezzrow, and twenty others have their words come to life — not because a serious dull voiceover reads them to us, but because Kaufman has arranged for some of the most famous people in the world to read a few passages. Do the names Bill Cosby and Janet Jackson suggest how seriously other people took this project? It has been selected to be shown at the 50th annual New York Film Festival, tentatively on September 29, which in itself is a great honor. That’s the beautiful part. Now here comes four bars of gritty reality. In the ideal world, no one would ever have to ask for money, and a major studio would already have done a beautiful job of exploring Chick Webb’s heroism, generosity, and music by now. But it hasn’t happened, and we know what results when the stories we love go Hollywood. Filmmaker Kaufman is looking for funding through INDIEGOGO to arrange a “proper launch” for this film — the goal being $5000 to cover the extra work of our PR team (media, publicity, sales, etc), and other key expenses that will help lead to a commercial release. All levels of support (ideally $75 and up) will make a real difference. Here is the link. Think of a world made better by swing. See and support this film. Jazz owes a great deal to people who never take a chorus: Milt Gabler and Lucille Armstrong, Norman Granz and Helen Oakley Dance. And Charles Peterson. Between 1935 and 1951, his camera and flashbulbs ready, Peterson went to jazz clubs, parties, concerts, and recording sessions. That in itself would be enough, but he also approached his subjects in subtle, ingenious ways. He avoided the formulaic full-frontal studio portraits or the equally hackneyed poses that jazz musicians are forced into. He saw what other photographers didn’t. Granted, he had wonderful visual material to work with. Many jazz musicians are unconsciously expressive, even dramatic, when they play, sing, or listen; many of them have eloquently unusual faces. But who was Charles Peterson? His son, Don, who takes such good care of his father’s invaluable prints and negatives, told me about his father’s fascinating life. And, not incidentally, the photographs that follow are reproduced with Don’s permission. Charles Peterson wasn’t born with a camera in his hand, just off Fifty-Second Street. Rather, he was born to Swedish wheat farmers in Minnesota on January 3, 1900. On a trip to New Orleans while he was still in high school, he bought himself a banjo in a pawnshop. Musically self-taught, he spent his college years playing local dance halls and summer resort hotels. By 1926, he was such an accomplished jazz player on guitar and banjo that he was part of a band with a residency at the Dacotah Hotel in Grand Forks, North Dakota. The band was so good that its stars were raided for big bands as far away as Chicago — bands whose leaders were alumni of the Paul Whiteman Orchestra. Peterson had what they called “pluck” in those days, and drove his Mercer Raceabout to New York City to interview for job in publishing. But once there he followed his love of music, and he met Pee Wee Russell and many of Russell’s Chicago colleagues and friends — including one Eddie Condon. He and Pee Wee shared a room and Peterson worked with first-string hot jazz players including Wingy Manone. But hot jazz didn’t pay well, and Peterson found steady employment with Rudy Vallee and his Connecticut Yankees, a successful but much more staid group. Married and with a son, Peterson looked for a steady job instead of one-nighters on the road. With the money he had saved from Vallee, where he had been earning $300 a week in the Depression, Peterson took a year off to study photography at the Clarence White School — on the recommendation of Edward Steichen (Peterson had met Steichen when Steichen was photographing the Connecticut Yankees for Vanity Fair. Peterson’s knowledge of the music business and his friendship with musicians were invaluable, and he was at the right place and moment in history — not simply because he took rooms above the Onyx Club. He began with portraits and publicity shots, then moved to capturing jazz players and singers in action — Jack Teagarden, Bunny Berigan, Billie Holiday, Sidney Bechet, and dozens of others in big bands and small, jam sessions and apartment get-togethers. His photographs were prominently featured in multi-page spreads in LIFE and other glossy magazines. Don remembers that while he was a fifth-grader at the progressive Walt Whitman School, his father assembled a jazz band to play for the students and their families in an informal concert that began at 1 PM and went on into the evening. The participants? Only Louis Armstrong, Brad Gowans, Pee Wee Russell, Bobby Hackett, Joe Sullivan, Eddie Condon, and Zutty Singleton — all Peterson’s friends. During the Second World War, Peterson’s jazz photography came to a halt, and after the war, although he photographed Ella Fitzgerald and Terry Gibbs, Buck Clayton, Joe Bushkin, the Red Norvo Trio, and his friends at Eddie Condon’s club, his career gradually came to a close in 1951. Peterson wasn’t fond of modern jazz and had moved, with his wife, to a small farm in Pennsylvania. He had many interests outside music and photography, and devoted himself to them — from farming to literature to metalwork and boats — until his death in 1976. Here are photographs by Charles Peterson that have not been published anywhere else — the first of several installments. The first one isn’t a classic photo, but we need to the man himself — in the best company. Peterson sometimes liked to include himself in the shot, so he would set up his camera, arrange the photograph, and ask a competent anonymous amateur to press the button. He did just that on December 29, 1940, capturing himself and Pee Wee Russell at a private party in what I assume is a New York City apartment. It is a candid snapshot: I imagine Peterson saying to someone, “Hey, take a picture of Pee Wee and myself,” and the person holding the camera has waited a beat too long. Pee Wee’s amused expression is beginning to freeze; surely he would rather have lit the cigarette in his hand. Peterson himself is caught in the middle of saying something perhaps under his breath, which I imagine as “Press the button already.” A professional photographer wouldn’t have made this a trio of Peterson, Rinso, and Russell, either. But we see Peterson in his natural surroundings, someone who could have been taken for a handsome, sharply-dressed character actor in a current film. 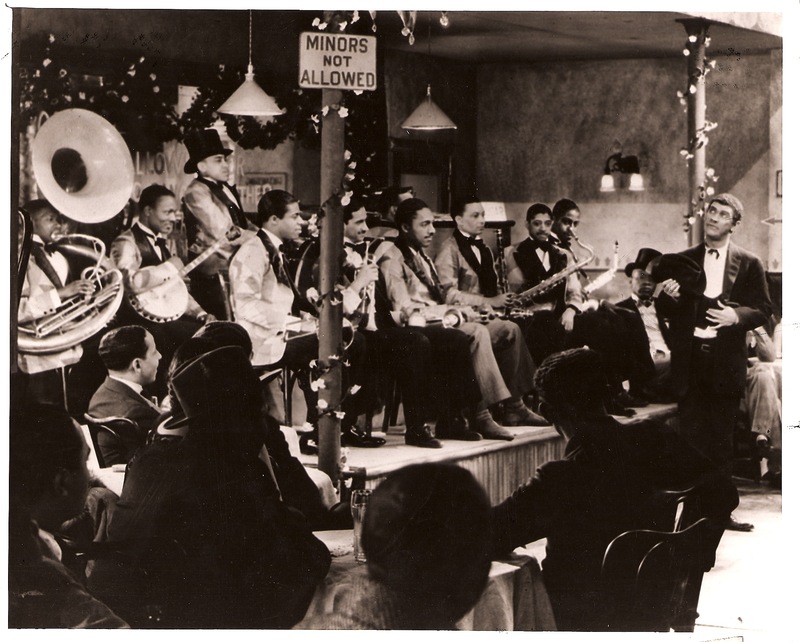 Peterson captured the whole Port of Harlem Seven — including Frank Newton, J.C. Higginbotham, Meade Lux Lewis, Johnny Williams, Teddy Bunn — in action, but he chose in this shot to concentrate on Sidney Bechet, who would eventually give up the clarinet for the soprano saxophone, and Sidney Catlett. In this photograph, it is June, and although musicians typically kept their suits and hats on while recording, Catlett has come prepared to exert himself, dressed for hot work in an open-necked short-sleeve shirt that seems more country than town, with suspenders that pull his suit trousers up beyond what we might think of as comfortable. If there was any doubt as to why he was called “Big Sid,” this photo should act as silent testimony to breadth as well as height: his shoulders, the solidity of his upper arms, even though the fingers of his right hand are holding the drumstick gracefully and delicately, the suggestions of Native American bone structure in his face. What Peterson understood, even in the restrictive confines of the recording studio, where the photographer has no control over what his subjects are doing — this is obviously the very opposite of a “posed” shot — was the possibilities of shadow and light. Figuring out what the camera and the flashbulb would make bright, half-bright, dim, or black, determined much more about the total effect of the shot. Look closely at Catlett’s three cymbals — from the left, a Chinese cymbal, then in right foreground a ride cymbal, and apparently submerged beneath it, the top of his hi-hat: three pieces of round metal, all except the Chinese tapering down from a center cap to their edge. Without noticing it at first, the viewer takes in the different visual textures of the three: the Chinese cymbal, its surface not flat but rather a series of small convexities, appearing dark and light, “like gold to airy thinness beat”; the top of the ride bymbal, although not grooved, reflecting light much like the grooves of a 78 rpm record; the hi-hat, darkly hidden beneath it. The viewer senses the shadowing of Catlett’s face, highlighting the texture of his skin, the solidity of his skull, and the dark shadow on the studio wall. Peterson’s photographs have resonant depth, unlike our modern digital snapshots of groups of people that make their subjects look like cardboard figures flattened against the wall. Nothing is blurred, even though these two men are in motion; one imagines the exultant, gutty sounds they make. Many photographs of trumpet players catch them straight-on, their faces wracked with the effort of hitting a high note. Foreshortening makes them look tiny behind the bell of their horn. This June 1939 photograph, taken from the side, catches Roy Eldridge at the Arcadia Ballroom as he takes a breath between multi-noted phrases. Taking in air, he appears to be smiling, and it’s a good possibility he is. To his right, tenor saxophonist Franz Jackson is clapping his hands, an arranged routine — the band marking time rhythmically as Eldridge, in the best Louis manner, hits some high ones at the climax of a hot number. The bassist, who may be Ted Sturgis, is concentrating, as is the guitarist. Jackson’s section-mate in the reeds is also keeping time enthusiastically. Peterson has framed his shot so that Eldridge and his horn are central, an upturned capital letter L, with all the light focused on that silvery mute, where all the energy was focused. Luckily for us, this band broadcast on the radio, and airshots were issued thirty-five years later . . . . so one could play these exuberant performance while burying oneself in this photograph — the nearest thing possible to going back in time. In 1945, Sidney Bechet formed a quintet for an extended run at “Boston’s Hot-spot of Rhythm,” the Savoy Cafe. This photograph captures the band when Bunk Johnson was the trumpeter; bassist Pops Foster stayed throughout the run. Bunk had a hard time keeping up with Bechet, who seemed to have limitless energy and stamina. Bechet also shared the front line with the rather introverted Peter Bocage; finally, the only trumpeter who could stand alongside Sidney and not be swept away was the 18-year old Johnny Windhurst, whose golden tone and youthful verve come through on airshots of the band’s “Jazz Nocturne” broadcasts. In this photograph, it’s hard to imagine the tempo that the band is playing, but we feel the unstated contest of wills. Bechet is fierce: his head and eyes revealing the effort. Pops Foster is smiling at what Sidney is playing; one side of his shirt collar is trying to break free. Bunk is sitting down, his horn pointed downward, its shadow a dark arrow. His face is serious, even pained. Were his teeth bothering him? Was he feeling the strain of trying to equal Bechet? Was he only playing a quiet countermelody? It’s impossible to tell, but the picture is a study in masterful power: Bechet has it, Pops Foster is riding in its wake, and Bunk looks nearly exhausted, defeated by it. This photograph, taken at a Jimmy Ryan’s Sunday afternoon jam session on November 9, 1941, is the emotional opposite of the struggle bwetween Bechet and Bunk. There is no struggle for mastery between trombonist Vic Dickenson and bassist Al Morgan. Rather, the bell of Vic’s horn is close to Morgan’s ear. Through that length of metal tubing, Vic is telling Morgan something important and gratifying. What’s the secret? Is it a characteristically deep meditation on the nature of the blues, or is it exactly why all the boys treated Sister Kate so nice? We’ll never know, but Morgan hears it, and his smile shows that he gets it, too. More photographs to come — including Billie Holiday, Frank Newton, Bobby Hackett, Eddie Condon, and some surprises.